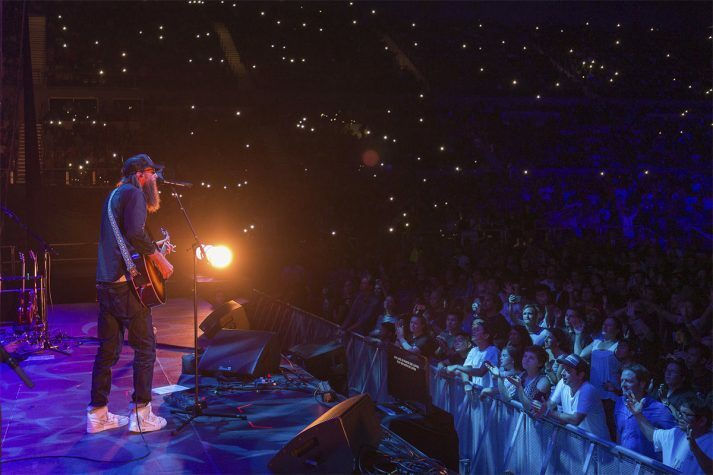 A crowd of more than 9,000 packed Melbourne Arena in Australia on Saturday for the Graham Tour, and hundreds responded to Franklin Graham’s Gospel invitation. Singer Steve Grace played worship music outside the stadium for those who were unable to enter. It can sometimes be tricky to recognize when God is moving in a heart. The stirring inside is not always visible. But there is a sound. Oh, yeah, there’s that sweet sound of celebrating a new life in Christ that’s unmistakably powerful. 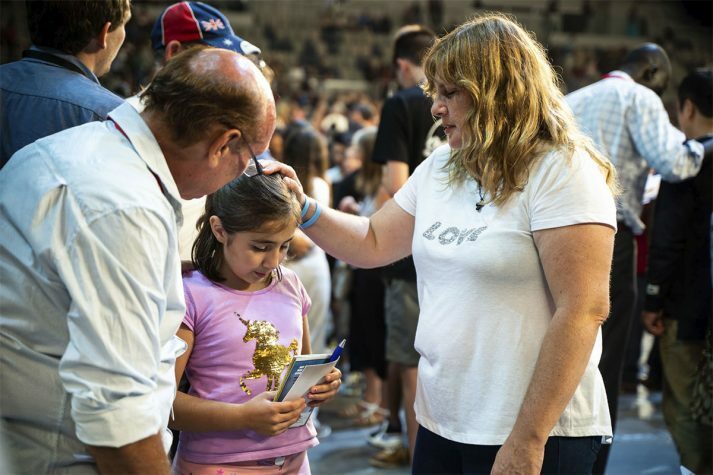 Franklin Graham had just led more than 400 people packed in front of the Melbourne Arena floor stage in a prayer of salvation, when the crowd erupted on Saturday. That moment. It’s what makes all the planning for an event like the Graham Tour, criss-crossing the Good News to six different Australia cities in 16 days, totally worth it. It never gets old. And it’s why the Billy Graham Evangelistic Association exists. A couple hours later in the relatively nearby Philippines, that same sound is reverberating, as Will Graham gave his eighth Gospel message and invitation in a week’s time. Between the two events last night, hundreds more watching around the world also indicated decisions for Christ watching on computers and cell phones. The angels’ voices were not getting much of a break. All ages made decisions for Christ on Saturday in Melbourne, but nearly half were age 25 and under. And now Brooke Wilson does, too. The 27-year-old prayer volunteer from the eastern suburb of Montrose had the privilege of walking 17-year-old Mesy through what it means to accept Christ into her life. Repentance. Forgiveness. Surrender. “I was a bit nervous to be honest,” Brooke said. “I’m a bit dyslexic. But I think it’s very exciting to see someone enter the Kingdom. Malcom Parkinson had a similar reaction to his encounter with Ray. The college-age man confessed to Malcolm that he felt five years ago, God had called him to receive Jesus into his life. But he never started going to church. Ray’s new church in Werribee, about an hour west of Melbourne, immediately invited him to the Graham Tour event. He came and heard Franklin Graham preach on Manasseh from 2 Kings. Manasseh was the 12-year-old king who re-introduced pagan worshipping practices and even sacrificed his own son before being captured by the Assyrian army. After ruling for 55 years, he finally called out to God for help. Ray had already felt the Lord prick his heart prior to Saturday, but he’d never made a public profession of faith. Malcom made sure Ray knew what it meant to put his trust and faith in Jesus. Shortly after, Malcom’s face was still radiating as the Melbourne Graham Tour stop left him nearly speechless. Wait—the Graham Tour? What is this? 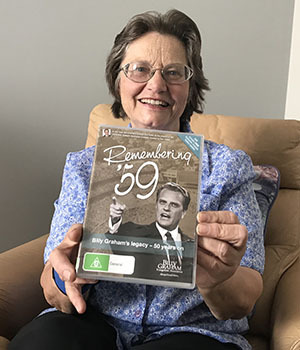 Billy Graham and his family have ministered to Melbourne’s Jenny Haines and her family for 60 years. “Every connection has been like booster jets to my faith,” she said. Jenny Hailes had no idea that Franklin Graham was coming until she saw something pop up recently on her phone’s social media. She quickly went to a computer to get a better look at this Graham Tour event. And it was all true. Franklin Graham was returning to Melbourne and all the seats were free to the public. Every time the Grahams come to town, Jenny makes sure she goes, regardless of how difficult. Starting back in 1959 as a six-year-old, Jenny attended the Billy Graham Southern Cross Crusade, first at Festival Hall and then to the newly completed Sidney Myer Music Bowl, to the Royal Melbourne Agricultural Showgrounds and ending at the Melbourne Cricket Grounds. She attended again in 1969, this time in the choir. Then again in 1995 to a Melbourne suburb of Clayton to watch the Global Mission event. Then in 2005, when Franklin Graham came to Melbourne, she became a counselor. And again in 2008, when Will Graham came to the area. But Saturday was a bigger challenge. Jenny, who has broken 22 bones from “spontaneous fractures,” is currently dealing with a broken foot and fractured hip socket. 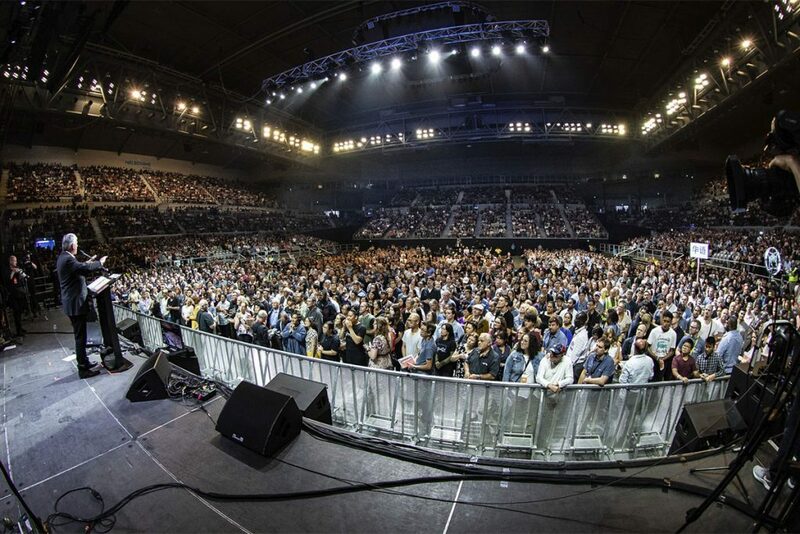 But that didn’t stop her from coming to the Graham Tour at Melbourne Arena on the 60th anniversary of Billy Graham’s historical 1959 Crusades, which reached an estimated half of Australia’s population that year. It hasn’t been an easy life for Jenny, who has had to overcome many health issues (she beat breast cancer) as well as domestic issues, but her faith in Jesus has sustained her every step. And along the way, both her sister (1959) and her son, James Peter Kemp (1995) accepted Christ at Billy Graham events. Her mom, Elsa, and the family grew up reading Decision magazine regularly, and for the longest time Sunday nights were reserved to listen to “The Hour of Decision,” around 7 or 7:30. “Right after tea,” she said. Looking for peace with God? Stop searching today. Crowder continues the Graham Tour with Franklin Graham and others on Feb. 18 in Brisbane. Next stop after that is Adelaide on Feb. 20 and Sydney on Feb. 23 and 24.